Deburr & bevel edges the easy way while getting consistent results every time. 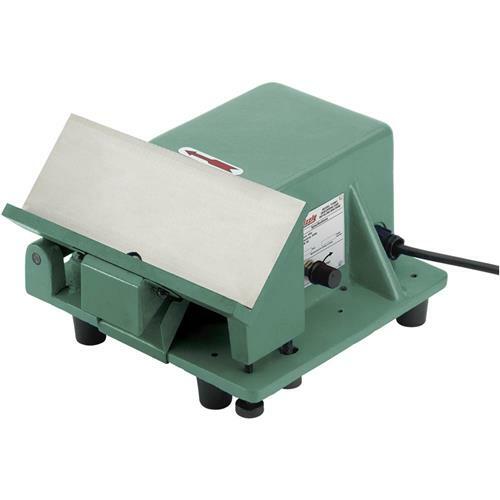 This stationary Deburring & Beveling machine is powered by a 1/2 HP motor and includes a carbide cutter. Features include variable speed to 4300 RPM & adjustable depth of cut. The cutter arbor is .010 eccentric and a replacement one was the same, but otherwise a good machine. Probably not a problem for most people, but I need more precision for the jobs I do, so I'll just make my own arbor so it is concentric. I'm happy with it overall. Had to deburr the notched out area where the cutter is. I needed an alternative to using a scotch brite wheel on corners of parts. I could not justify the cost of the Burr Beaver. This is great alternative!